The terms design and composition in art refer to the planning and/or arrangement of form and/or color, in two- or three-dimensional work. Design/composition is one of the "formal" elements used in art, along with space, color, value (lights and darks), and other elements. Please see Glossary of Art Terms for definitions. In Europe in the late 19th century, many artists, including Whistler, declared that painting is not primarily an imitation of the external world, but rather, an arrangement of shapes and colors on a flat surface. Whistler himself named many of his works in terms of colors used, e.g., his painting commonly called Whistler's Mother was actually named Arrangement in Black and Gray. Artists had been aware of this primacy of underlying structure in painting for centuries prior to the 1890's. The old masters did preliminary compositional studies, many very structural in nature; however, the underlying structure was then covered over by the subject matter of the work, humbly taking a back seat. 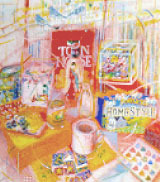 Red, Yellow, and Blue, oil on canvas, Nancy Doyle. The pictorial structure, or architecture, of this painting consists of a large, irregular diamond shape (underpainted in red), which goes off the edges of the work on three sides. Within this diamond, there are smaller geometric shapes, such as triangles, rectangles and cylinders, as well as curvilinear elements and intersecting diagonals. Modern artists differed in this only in that they started to leave the skeletal structure of the work more and more visible, finally allowing the compositional structure to itself be the subject of painting in the 20th century; not only not hidden, but shorn of any pretense of imitating the objective world. From the Renaissance, when linear perspective was developed, to the late 19th century, composing was perceived as the depiction of objects and planes receding in space. After 1890, painting became more consciously two-dimensional, with the primacy of the 'pictorial' surface, described as having a 'sense of surface,' as opposed to depicting the illusion of depth as before. Like the notes, melody, and arrangement of jazz or classical music are to the musician, so are the lines, colors, shapes, composition, and space to the painter. These have an identity and intrinsic value of their own, as well as for subject matter; and they are all inter-related. Composition consists of "perfecting" the inter-relationships of all these elements, which become infinite. Non-representational art is similar to instrumental music - there are no words, but incredible things can still be expressed - maybe more than with representational work, as with a Beethoven symphony. Using recognizable objects can sometimes get in the way of expressing a universal and profound truth; they draw attention to the particular, temporal and mundane, or they function as literary symbols. With the purity of geometric or other abstract form, one can speak to all times and places. When serious artists "speak," they are not using words - at least not in the usual sense of words. They are mostly not dealing with literary content, such as metaphor or symbol, although metaphor and symbolism may play an equivalent role in visual terms, expressed as an artist's personal iconography. Artists use concrete and abstract means to express their vision - which cannot be expressed in words - otherwise it would have been born as a novel or poem. Like music, art is a preliterate activity; that usually means that we need to discard our civilized clothing and preconceptions at the door, and walk in with arms at our sides and mouths closed, watching, and let it affect us in the same way music does - we need to just be receptive to all the ways it affects us, in non-verbal thought and feeling. The formal elements of color, space, composition, etc. apply to both fine art and commercial art, and the same design principles (harmony, balance, etc.) apply. However, the intention of the artist in each situation generally differs - that is, the commercial artist is trying to sell a product, and the serious fine artist is attempting to express something more profound and meaningful, without the primary purpose of commercial value. This difference of intent affects dramatically the creative choices each will make, as well as the ultimate value of the artistic result. Artists have always been influenced by their environment. I think this explains why, for instance, Chinese landscape painting has a certain look (because of their distinctive landscape); modern art became more geometric when industrialization caused architecture to change at the turn of the 20th century; contemporary American art has been influenced greatly by such things as the billboard, commercial packaging, comic strips, etc. - because these things are all around us; and Minimalism appeared at the time when technology started to herd us into little cubicles, both physical and psychological. As well as being influenced by our environment, artists are also motivated by their 'inner necessity,' as Kandinsky called it. These two forces cause artists to make their choices regarding the form their art will take. Contemporary conceptual artists often base their work on an idea, rather than resulting in a traditional art object (e.g., painting or sculpture); in this case, there is little or no visual component to their work: no composition, no formal values, no drawing, etc. But in these lessons in composition, I am dealing with more or less traditional visual ideas of design and composition. These lessons are not meant to be an all-encompassing design study, such as might be found in a university design course, but rather just some things I have learned about design and composition in painting. Generally speaking, paintings can be said to lie more in either the area of form/drawing, or of color, particularly from the Renaissance until the mid- to late 20th century - it is very difficult to concentrate equally on both areas, and your work can be enhanced by narrowing your field of study. Plus, artists are often drawn temperamentally either to color or drawing, the proverbial romantic versus classical duality. Thus, the analytical Cubists dealt somewhat more with form and space than with color (in fact, much of their color is limited to a few neutral colors), and the Fauves dealt more with color than with form and structure. A painter friend once thus described the act of painting as like juggling 30 grapefruits - you're dealing simultaneously with color, space, value, composition, form, movement, drawing, etc., and sometimes, especially when a student, this can seem overwhelming. In much of modern art (ca. 1900-1955), this meant that every paint stroke should embody the "perfect" color, value, spatial, compositional, and spiritual relationship with all other strokes or shapes - a stringent and infinite endeavor - perhaps a legacy of Cezanne. Generally, an artist or artistic movement will concentrate on certain formal aspects of interest to them, whether slightly, as in Pop art, or to the extreme, as in Minimalism. To see the architecture of the composition clearly, you can look at Persian and Turkish miniature paintings from the 14th century. Certain of these miniatures (which are extremely beautiful) have as their subject matter, as well as pictorial structure, an elaborately designed building of that time, within which various figures are shown. At this link, there are a number of examples of Persian miniatures, in some of which the subject and the underlying structure of the paintings are both architecture. See if you can see how the architecture of the buildings represented becomes also the pictorial architecture of the artwork.